This week we’ve received news from three companies that have struck out in search of new markets for their fundamental processes, and new applications for biotechnology in some ancient and ossified markets such as jet fuel, C3 chemicals and gasoline. In France, Global Bioenergies has started the start of the scale-up phase of a process converting renewable resources into acetone and isopropanol, two 3-carbon compounds that are extensively used in solvents, materials, and cosmetics. These compounds can subsequently be converted into propylene, a key molecule in the plastics industry. The process has been transferred to ARD, a company installed on the Pomacle-Bazancourt agro-industrial site and a specialist in scaling up fermentation processes, and the first pilot run has been successfully completed. This innovative process is based on converting renewable resources by fermentation using bacterial strains with an engineered cellular metabolism. In nature, some bacteria produce acetone, but with a limited yield. Global Bioenergies’ innovation consists in radically remodeling the core carbon metabolism of the strains thereby unlocking high yields of sugar conversion. The markets for both these 3-carbon compounds are well established and worth billions of dollars. In a further process, these two compounds can be converted to propylene, a key petrochemical building block with a market valued in excess of US$100 billion. Founded in 2008, Global Bioenergies’ most technically mature process is for the production of isobutene, a 4-carbon compound, from which fuels and materials are derived. While the process continues to be improved in the laboratory, demo plant trials are under way, and a full-scale plant project is being studied in a joint venture with Cristal Union, Europe’s fourth-largest sugar producer. In Colorado, GE Aviation has commenced jet engine combustor component testing with a jet fuel comprised 100% of Gevo’s renewable alcohol-to-jet fuel . The testing is being performed as part of the Federal Aviation Authority’s Continuous Lower Energy, Emissions and Noise Program. Specifically, this testing is designed to enable the greater displacement of petroleum-based jet fuel by bio-based alternative products. Bio-based hydrocarbon fuels have similar performance characteristics to the petroleum-based fuels used today, albeit with reductions in particulate matter and other air quality related emissions. Some bio-based jet fuels, such as Gevo’s ATJ, have the potential to improve performance, such as providing greater energy density which translates into better mileage. In November 2016, we reported that Alaska Airlines made the first commercial flight using Gevo’s cellulosic renewable alcohol to jet fuel, originating in Seattle and flying to Ronald Reagan Washington National Airport. Monday’s flight follows on the back of the two commercial flights that were flown by Alaska Airlines on Gevo’s ATJ in June of this year. The ATJ for the June flights was derived from isobutanol produced at the Gevo’s facility in Luverne, MN, using sustainable corn as the sugar feedstock. And in September 2016, we reported that Gevo inked an agreement with Lufthansa to supply Gevo’s alcohol-to-jet fuel from its first commercial hydrocarbons facility, intended to be built in Luverne, MN. The terms of the agreement contemplate Lufthansa purchasing up to 8 million gallons per year of ATJ from Gevo, or up to 40 million gallons over the 5 year life of the off-take agreement. “GE Aviation’s collaboration with the FAA and Gevo under CLEEN is an excellent example of our long-standing commitment to sustainable aviation. Efforts such as this one are expected to help accelerate the transition from petroleum-based fuels to more environmentally friendly ones,” said Dr. Gurhan Andac, Engineering Leader, Aviation Fuels & Additives, GE Aviation. “If we are truly going to reduce our greenhouse gas (GHG) emissions from aviation, we need to be able to replace larger percentages of petroleum jet fuel with bio-based alternatives such as Gevo’s ATJ. The future is to replace the whole barrel of oil with bio-based hydrocarbons that stimulate the economy, mitigate GHG emissions, draw on abundant resources and enhance sustainability. We want to thank the FAA and GE Aviation for their vision in supporting projects like this one,” said Gevo CEO Dr. Patrick Gruber. In California, Siluria Technologies and Wood have released their new Modus process technology, a cost-efficient, one step process to upgrade low value refinery off gases, otherwise burned for heat, into high value fungible refinery products. 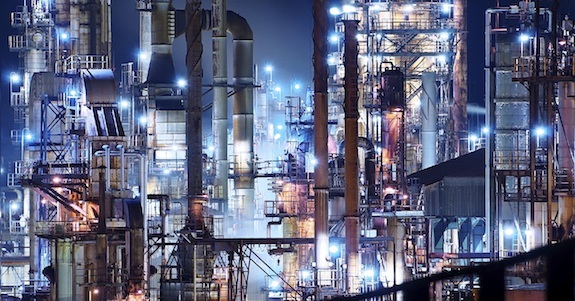 While the cost to install Modus depends upon specific refinery size, configuration, and layout, for a typical refinery the total cost is usually less than $50M, with a short 1 to 3-year payback period. Installation of Modus is performed using modular construction (e.g. constructed in modules that are shipped by truck and assembled onsite), which allows for very rapid installation and integration into the refinery’s operations. Installation at the refinery can be performed during routine maintenance turnaround periods. And, Modus allows refiners to potentially reduce their environmental emissions by avoiding the burning of olefins, which can cause high particulate and other air emissions. Siluria’s oxidative coupling of methane technology, catalytically converts methane (and can co-feed ethane) into ethylene and water. Ethylene is the world’s largest petrochemical building block used in the production of a wide range of plastics, coatings, adhesives, engine coolants, detergents and other everyday products. Ethylene from the OCM reaction can be purified using conventional separations technologies, resulting in petrochemical grade ethylene ready for use in downstream chemical production or transport in an ethylene pipeline. Now, Siluria has developed a second process, known as Ethylene to Liquids to convert unpurified ethylene from the OCM process to hydrocarbon liquid fuels. The OCM ethylene effluent is oligomerized over a different catalyst to selectively produce targeted products, such as gasoline, condensate, aromatics, heavy oil diluents or distillates including diesel or jet fuel. Siluria’s ETL catalyst development strategy has leveraged decades old commercial alkene oligomerization catalyst experience and practice. Through catalyst formulation and process condition optimization, The ETL process is being developed in a large-scale integrated pilot reactor system located in Siluria’s Hayward, California facility. Siluria’s OCM + ETL process differs substantially from other Gas to Liquid (GTL) processes, such as Fischer-Tropsch and Methanol to Gasoline. For example, Siluria’s OCM+ETL process does not go through any syngas (carbon monoxide and hydrogen) intermediates, which is utilized in the FT process. Converting syngas into hydrocarbon products result in a broad product distribution ranging typically from C1 to C40. This necessitates significant additional refining/separations and energy input. In contrast, utilizing ethylene results in a simpler process, lower capital costs and more flexibility in term of scale. Why is OCM new, or is it? OCM has been around for a generation, as a technology. The problem is that no one has been able to make OCM work on an economic basis – the catalysts just didn’t have the right selectivity or activity rates. After a great deal of excitement and research in the 80s and 90s, attention petered out. But, inspired by the way nanomaterials are created by nature, Siluria develops metals and metal oxide crystals grown on biological templates. The metals coating the virus form a nanotube structure they refer to as a “hairball”, giving the catalyst a greater surface area, which enhances the reactions, at temperatures 200 to 300 below current steam cracking methods, greatly reducing the energy needed by current technology to produce ethylene.